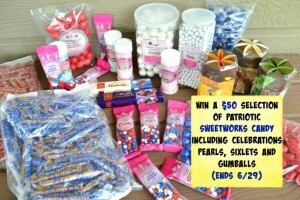 $50 Sweetworks Candy Giveaway | A Savings WOW! To help make your decorating life so much easier, Sweetworks is giving away a $50 gift pack pack over at Mommy Snippets blog. To enter, leave a comment to the question asked on Giveaway Tools, on the Mommy Snippets feature and plug in extra entry options to increase your chances of winning. Disclaimer: This giveaway is hosted by Mommy Snippets and sponsored by Sweetworks. You must be 18 years old and older to enter and reside in the US. No purchase is necessary to enter. Void where prohibited by law. The odds of winning are based on the number of entries received. The sponsor(s) will be responsible for product shipment to winner(s) of this giveaway. My blog is not responsible for product shipment/delivery. This event is in no way administered, sponsored, or endorsed by, or associated with, Facebook and/or Twitter, Google, Pinterest, Instagram or Klout. This disclosure is done in accordance with the Federal Trade Commission 10 CFR, Part 255 Guides Concerning the Use of Endorsements. It is at the sole discretion of the admin of the giveaway if the winner has met the rules or not.